In the 18 month history of 2frugalfoodies, this is the longest break we’ve ever taken from blogging. We’re sorry to leave you hanging for so long, but we were in NYC and then down in Charlotte, and now we’re back and trying to re-acquaint ourselves with real life. New York was incredible- what a city! We were both able to eat some incredible food and we hope to share some of those experiences with you and try some new recipes on 2frugalfoodies. 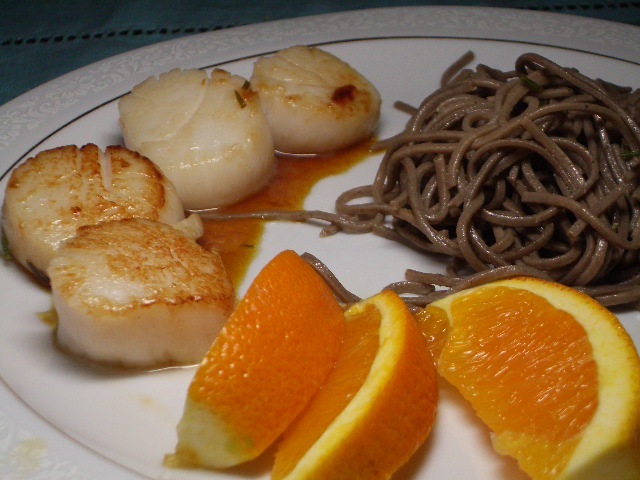 As you’re probably tired of hearing about Anthony Bourdain and seeing meat-filled recipes, we have something a little bit different today- sea scallops with an orange sauce. The recipe is really simple, with a small ingredient list. It’s a great example of the importance of mis en place- if you get everything together ahead of time, it’ll be a breeze when you’re actually cooking.